If you already booked a Deutsche Bahn ticket and want to make a seat reservation, see this section. If you already booked an ÖBB ticket and want to make a seat reservation, see this section. 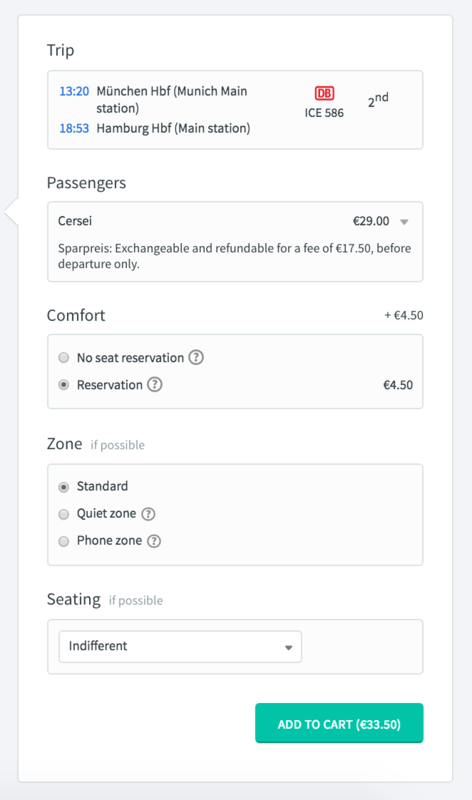 If you want to book an SBB ticket with a seat reservation included, see this section. A confusing factor about train travel in a foreign country is knowing what is necessary and what isn’t. This is especially the case with seat reservations for trains. With some tickets you need to have a reservation and with others it’s simply not possible. For this reason we want to clear these things up for you, so you can travel like a local. In short, a seating reservation means you receive a seat which is assigned to you personally. Just like a seat on an airline. Having a seat reservation can be very good thing but not always necessary or possible. How will you know if you need a reservation or if it is even possible to have one? Firstly you need to determine what type of train you will be on. Some trains such as the high-speed TGV or overnight trains, will always require a seat reservation. Having a seat reservation not only determines where you will be sitting on the train but also binds you to a particular train. Tickets for these trains will always be sold with a reservation. This is why Trainline gives you the option of stating your seating preferences. There is only one circumstance in which you will not receive a seat reservation for trains which have compulsory reservations and that is when you are booking last-minute and the train is nearly at capacity. The rail carriers do not sell more tickets than the number of seats they have plus the seats in the luggage compartment. On some trains, especially those offered by Deutsche Bahn, it is not mandatory to have a reserved seat yet it is recommended if you do want to have guaranteed place to sit. 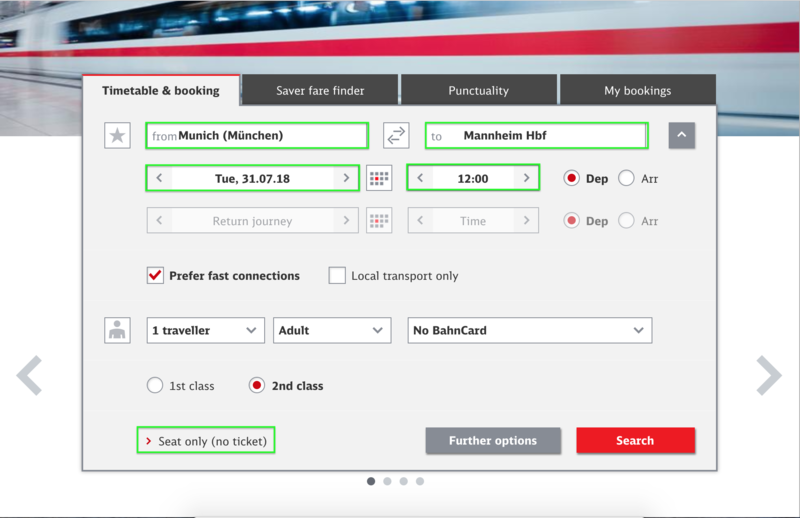 If you are booking a Deutsche Bahn train and you have an option to purchase a seat reservation (see picture above) then you can do so for an extra fee. If you choose not to purchase the reservation then you still have a very good chance of finding a seat. Just arrive at the platform early, 20 minutes before departure, so you can get onto the train in time and find a seat. On certain trains, such as regional trains in France, Italy, Germany, Spain, The Netherlands, Belgium, Switzerland, and Austria, it is not possible to have a reserved seat. This is because these trains do not have a mandatory reservation condition and therefore you can sit anywhere you wish. So if you do not see any seat reservations on your tickets or in your account then it means you are taking a train that does not have a reservation condition. It's possible to go to Deutsche Bahn’s website and purchase seat reservations for a ticket that you’ve already booked. 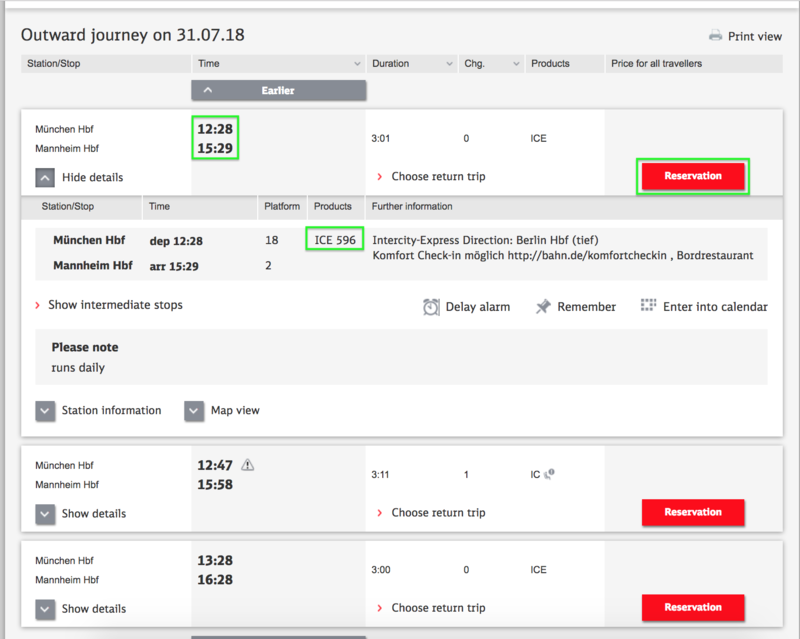 Go to the Deutsche Bahn website and enter your journey details, then click " seat only (no ticket)" from the search form (do not click the red "Search" button). You will select your journey from the options displayed (make sure you have the cities, train number, departure time, and number of connections correct). Click " Reservation". At this point, you will either create an account or book without registering and follow the instructions on the Deutsche Bahn site. It's possible to go to ÖBB's website and purchase seat reservations for a ticket that you’ve already booked. Go to ÖBB's ticket booking website. Enter your journey details (departure/arrival stations, date and time of departure). Click "Seat only (no ticket)". You will select your journey from the options displayed (make sure you have the cities, train number, departure time, and number of connections correct). Follow the instructions to purchase your seat reservation. It isn't possible to make SBB seat reservations online. Most travellers do not book seat reservations on SBB trains, but you can buy a seat reservation for your SBB ticket by calling them directly, or by going to an SBB counter before departure. Information for making a seat reservation with SBB can be found here.